This is the land of Brer Rabbit and Winnie the Pooh. 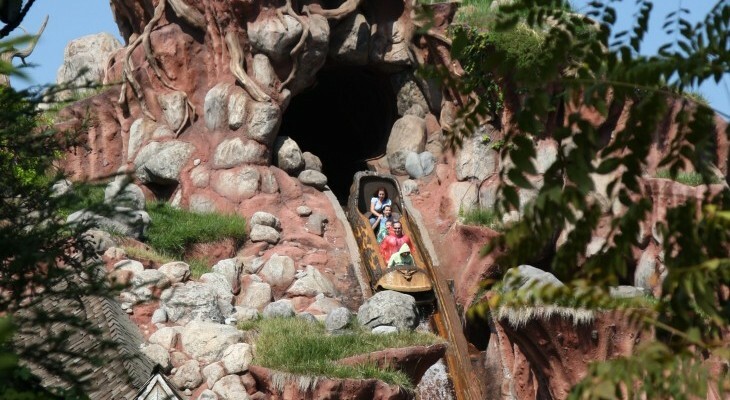 Among towering pine trees and rustic architecture take a ride on one of Disneyland’s favorite attractions, Splash Mountain, where you’ll cruise in a log through Brer Rabbit’s Laughin’ Place before the final doozy of a splashdown over a five-story waterfall and into an oversize briar patch. 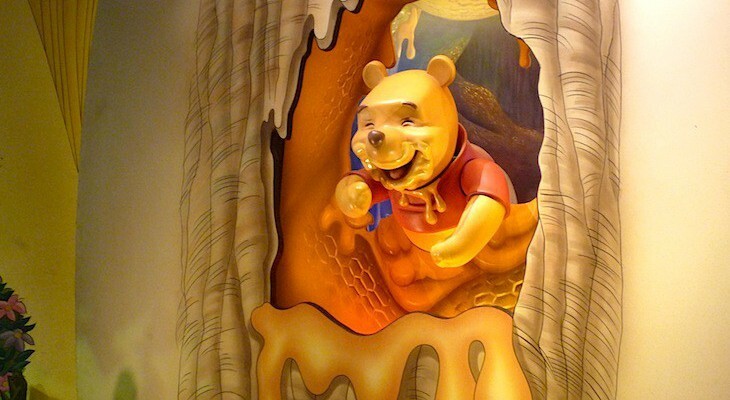 For a more serene adventure travel through Hundred Acre Wood on The Many Adventures of Winnie the Pooh. The Hungry Bear Restaurant is a good place to relax riverside with a burger in hand. This is one ride guaranteed to put a smile on your face. Who can resist the charms of Brer Rabbit, Brer Fox, Brer Bear, and the rest of the gang, even if it culminates in one heck of a plunge? Float in a hollowed-out log through Audio-Animatronics scenes from Disney’s classic film Song of the South, splashing and dropping through Brer Rabbit’s Laughin’ Place. Drift ’round the briar patch while toe-tapping music plays among the pumpkin and watermelon patches as you pass the lairs of Brer Fox and Brer Rabbit. Inside the mountain Brer Fox and Brer Bear cause plenty of commotion along the way as Brer Rabbit outwits them at every turn. As you float through bayous, marshes, and caverns, all is a delight to the eye, ear, and heart with loads of colorful detail and too-cute characters cavorting to the tune of the addictive theme song “Time to Be Moving Along.” When the ride creeps upward, heed the doomsday warnings of a gloomy pair of buzzards (“It’s turning-back time” and “We’ll show you a laughing place”) just before the final doozy of a splashdown over a five-story waterfall and into an oversize briar patch. It’s pretty tough to keep your eyes open (at least for first-timers), but try to grab a peek of the park from the top. And don’t think you missed the cherished “Zip-A-Dee-Doo-Da” tune; you’ll hear it on the way out. Not recommended for expectant mothers or those with back or neck problems. Minimum height 40 inches (3 feet, 4 inches). FASTPASS. Single-ride line. 11-minute ride. Cara's Tip: The drop’s really not as bad as it looks, so don’t let it keep you from experiencing one of the best rides Disney has to offer.